The majority of merchandise for Batman v Superman: Dawn of Justice won't go on sale until mid-January. But there will be a pre-Christmas push to get some stuff into stores before the holidays. And three of those items include some new T-shirts. These aren't your average run of the mill movie tie-in shirts, either. They're pretty scary. How does Metropolis and Gotham view their superheroes? Not as friendly, that's for sure. The first shirt seen here is pretty cool. It arrives in The Dark Knight's signature color of black. And in white print, it shows Batman as the Gotham Demon. 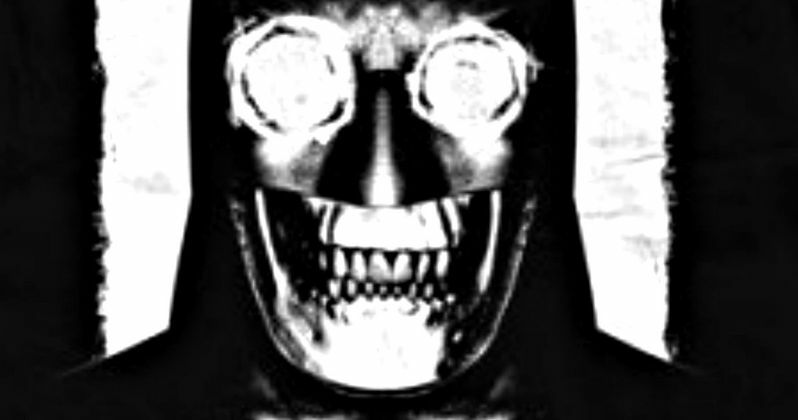 He is a skull in a cowl, his teeth and jaw bone grinning like a Jack-o-lantern. It's possibly the coolest Batman shirt to come along in ages. The Superman shirt isn't so bad, either. It sets up Kal-El as a False God. The super powered alien will be at the heart of a vast controversy. Should the governments of the world be allowed to let this dangerous extraterrestrial roam free? The Man of Steel is adorned with demon horns. And he has an x over his mouth. Clearly, his detractors do not wish to hear his lies. There is a third shirt here, and it's not that great. It arrives in blood red, and offers both Batman and Superman equal space. With the signature Batman v Superman: Dawn of Justice logo firmly in place as the centerpiece of this shirt, it gives its two superheroes cool sounding wrestler names. And what better for a brawl? Batman is being called the Gotham Guardian (which is a little friendlier than the Gotham Demon). And Superman is being touted as the Last Son of Krypton. With his name in bold at the top, Bruce Wayne clearly has the advantage here. Fearing the actions of a god-like superhero left unchecked, Gotham City's own formidable, forceful vigilante takes on Metropolis's most revered, modern-day savior, while the world wrestles with what sort of hero it really needs. And with Batman vs Superman at war with one another, a new threat quickly arises, putting mankind in greater danger than it's ever known before. Take a look at these shirts. Who's buying one? You can purchase them right now at merchoid.com.